Proquad is indicated for use in children 12 months to 12 years of age who need to be vaccinated against the measles, mumps, rubella, and varicella viruses. This used to mean getting two separate shots, the MMR and Varivax (chickenpox) vaccines, which according to the latest immunization schedule, most kids get when they are about 12 to 15 months old, with boosters at age 4 years. Like the separate MMR and Varivax vaccines, ProQuad is an attenuated live virus vaccine. With the combination vaccines ProQuad and Kinrix (IPV plus DTaP), most preschoolers can now get away with just two shots (still getting four vaccines) before they start kindergarten. Your pediatrician will likely also be cautious before giving ProQuad to your child if he has a history of cerebral injury, seizures, a family history of seizures, egg allergy, contact dermatitis from neomycin, thrombocytopenia, or if he is supposed to avoid the stress from a fever. The safety profile of ProQuad is similar to that of the separate MMR and Varivax vaccines. Children were more likely to have a fever, a rash at the injection site, and a measles-like rash after getting ProQuad, but were less likely to have pain, tenderness, and soreness at the injection site, than if they got separate MMR and Varivax shots. 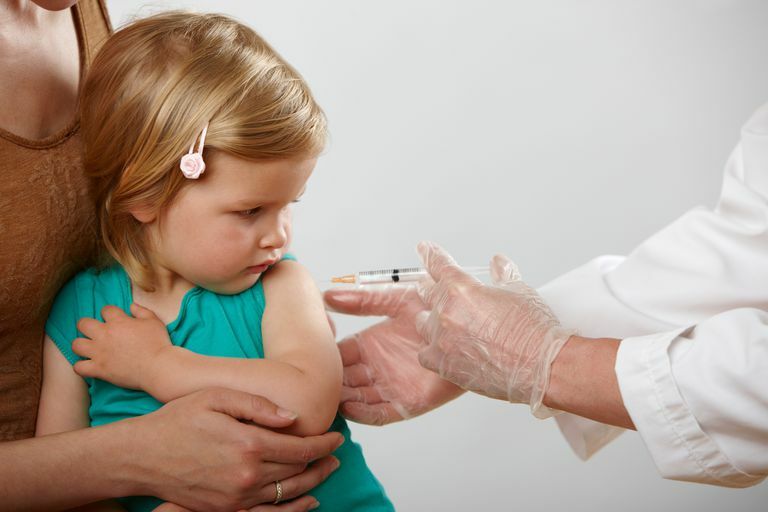 Post-marketing studies have found an increased rate of fever and febrile seizures in kids getting ProQuad vs. those getting separate MMR and Varivax shots. Unlike other combination vaccines, the Advisory Committee on Immunization Practices (ACIP) does not recommend ProQuad vs. the separate MMR and chickenpox vaccines for the first dose of the vaccines in young children. Because of the increased risk of fever and febrile seizures, unless a parent prefers ProQuad, they do not "express a preference for use of MMRV vaccine over separate injections of equivalent component vaccines". ProQuad is still preferred for the second dose of measles, mumps, rubella, and varicella vaccines and for kids over 47 months getting their first doses. Whichever vaccines you choose, ProQuad for separate MMR and chicken pox vaccines, get educated and get your kids vaccinated and protected. CDC. Use of Combination Measles, Mumps, Rubella, and Varicella Vaccine. MMWR. May 7, 2010 / 59(RR03);1-12. Klein NP, et al. Measles-containing vaccines and febrile seizures in children age 4 to 6 years. Pediatrics. 2012 May;129(5):809 -814. MMWR, March 14, 2008, Vol 57, #10. Update: Recommendations from the ACIP Regarding Administration of Combination MMRV Vaccine. ProQuad Product Label. August 2005.